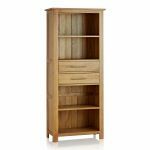 The Rivermead Natural Solid Oak Bookcase combines shelving space with handy drawer storage in an innovatively designed unit. 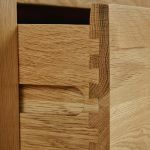 Set in the middle of the piece are two bar handled drawers, which have been crafted by expert joiners using traditional dovetail joints. 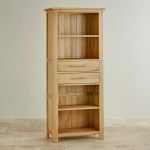 Surrounding these drawers are four deep solid oak shelves - perfect for displaying your prized book collection, DVDs or ornaments. 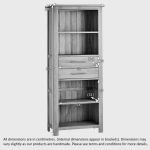 The A-grade oak timbers have been finished in a high grade wax polish, to enrich the grain patterns and bring out the natural lustre. We only ever use the finest materials and we never use MDF, chipboard or veneers in any of our products. The Rivermead design is cool and contemporary; ideal for a modern living space. 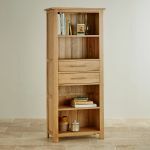 Take a look at the rest of this classic range to see how easy it is to co-ordinate your décor.